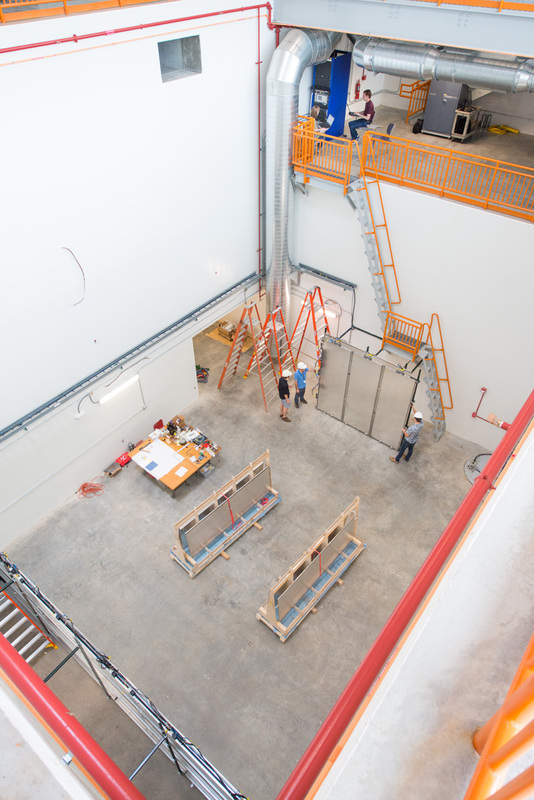 Members of the Short-Baseline Near Detector collaboration install the cosmic ray tagger in the SBND building. The cosmic ray tagger is made of the shiny, rectangular panels on the building floor. Photo: Reidar Hahn. On the morning of June 22, an important component of the Short-Baseline Near Detector (SBND) began taking data. The component, called the cosmic ray tagger, is the first of SBND’s subdetectors to be completed and operational. The SBND collaboration is constructing the Short-Baseline Near Detector piece by piece, and with the completion of the cosmic ray tagger, we’ve reached a construction and operations milestone. The SBND’s sought-after particle is the neutrino — a fleeting, difficult-to-capture particle. Adding to the difficulty is the fact that cosmic rays from outer space cloud the sought-after neutrino signal in the detector. The cosmic ray tagger, or CRT, is designed to identify the cosmic rays that rain down on the detector so scientists can subtract those traces from their data, revealing the neutrino signal. By functionality it is similar to the one installed earlier at the MicroBooNE detector, which you may have read about. The SBND collaboration installed and commissioned the cosmic ray tagger this month — in only two weeks. The CRT is composed of many finely grained modules capable of measuring an interaction instance to the nanosecond and to within a centimeter of its location in the CRT. With the newly operational cosmic ray tagger in its current configuration, SBND is currently characterizing the flux of particles called muons. These muons are produced by neutrinos from the Booster Neutrino Beamline so that scientists can measure their parameters in the SBND pit, where SBND will be built. Data taken during this characterization stage will be a great asset on the way to simulation and analysis for the whole SBND detector later on. The collaboration will continue to take data using the beam from the Booster Neutrino Beamline, as well as from cosmic rays, until the accelerator shutdown in July. When the accelerator complex restarts in October, we will restart data-taking using the CRT. We are grateful to collaborators at the University of Bern who designed and produced the CRT modules. And the swift installation and commissioning was possible thanks only to the tremendous dedication and commitment of many colleagues from the SBND collaboration as well as great support from Fermilab technical personnel. In the search for new physics, experiments based on high-energy collisions inside massive atom smashers are coming up empty-handed. So physicists are putting their faith in more-precise methods: less crash-and-grab and more watching-ways-of-wobbling. Next month, researchers in the United States will turn on one such experiment. It will make a super-accurate measurement of the way that muons, heavy cousins of electrons, behave in a magnetic field. And it could provide evidence of the existence of entirely new particles. The particles hunted by the new experiment, at the Fermi National Laboratory in Batavia, Illinois, comprise part of the virtual soup that surrounds and interacts with all forms of matter. Quantum theory says that short-lived virtual particles constantly ‘blip’ in and out of existence. Physicists already account for the effects of known virtual particles, such as photons and quarks. But the virtual soup might have mysterious, and as yet unidentified, ingredients. And muons could be particularly sensitive to them. 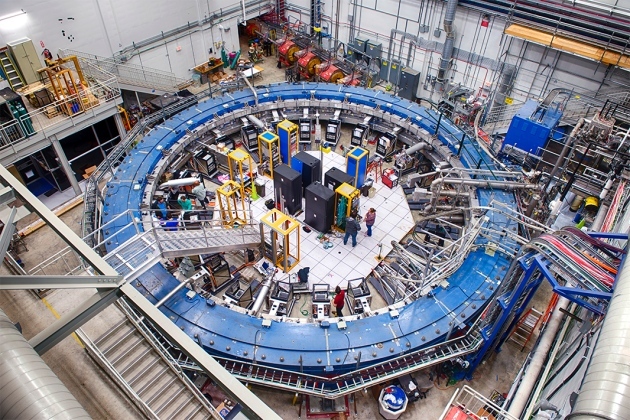 The new Muon g−2 experiment will measure this sensitivity with unparalleled precision. And in doing so, it will reanalyse a muon anomaly that has puzzled physicists for more than a decade. If the experiment confirms that the anomaly is real, then the most likely explanation is that it is caused by virtual particles that do not appear in the existing physics playbook — the standard model. “It would be the first direct evidence of not only physics beyond the standard model, but of entirely new particles,” says Dominik Stöckinger, a theorist at the Technical University of Dresden, Germany, and a member of the Muon g−2 collaboration. Physicists are crying out for a successor to the standard model — a theory that has been fantastically successful yet is known to be incomplete because it fails to account for many phenomena, such as the existence of dark matter. Experiments at the Large Hadron Collider (LHC) at CERN, Europe’s particle-physics lab near Geneva, Switzerland, have not revealed a specific chink, despite performing above expectation and carrying out hundreds of searches for physics beyond the standard model. 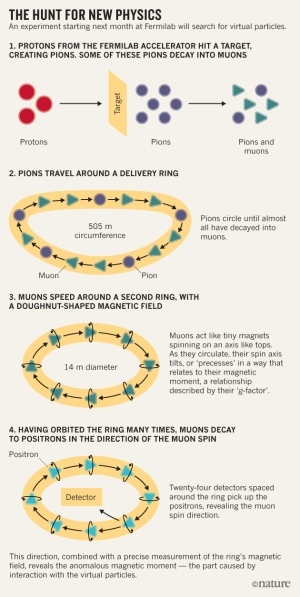 The muon anomaly is one of only a handful of leads that physicists have. Measurements of the muon’s magnetic moment — a fundamental property that relates to the particle’s inherent magnetism — could hold the key, because it is tweaked by interactions with virtual particles. When last measured 15 years ago at the Brookhaven National Laboratory in New York, the muon’s magnetic moment was larger than theory predicts. Physicists think that interaction with unknown particles, perhaps those envisaged by a theory called supersymmetry, might have caused this anomaly. Other possible explanations are a statistical fluke, or a flaw in the theorists᾽ standard-model calculation, which combines the complex effects of known particles. But that is becoming less likely, says Stöckinger, who says that new calculation methods and experimental cross-checks make the theoretical side much more robust than it was 15 years ago. “With this tantalizing result from Brookhaven, you really have to do a better experiment,” says Lee Roberts, a physicist at Boston University in Massachusetts, who is joint leader of the Muon g−2 experiment. The Fermilab set-up will use 20 times the number of muons used in the Brookhaven experiment to shrink uncertainty by a factor of 4. “If we agree, but with much smaller error, that will show definitively that there’s some particle that hasn’t been observed anywhere else,” he says. To probe the muons, Fermilab physicists will inject the particles into a magnetic field contained in a ring some 14 metres across. Each particle has a magnetic property called spin, which is analogous to Earth spinning on its axis. As the muons travel around the ring at close to the speed of light, their axes of rotation wobble in the field, like off-kilter spinning tops. Combining this precession rate with a measurement of the magnetic field gives the particles’ magnetic moment. Fermilab is the home of the Muon g−2 experiment. Although a positive result would give little indication of exactly what the new particles are, it would provide clues to how other experiments might pin them down. If the relatively large Brookhaven discrepancy is maintained, it can only come from relatively light particles, which should be within reach of the LHC, says Stöckinger, even if they interact so rarely that it takes years for them to emerge. You lose whether you use protons or electrons in your collider, for different reasons. Could the unstable muon solve both problems? A four-muon candidate event in the ATLAS detector at the Large Hadron Collider. The muon/anti-muon tracks are highlighted in red, as the long-lived muons travel farther than any other unstable particle. Image credit: ATLAS Collaboration / CERN. High-energy physics is facing its greatest crisis ever. The Standard Model is complete, as all the particles our most successful physics theories have predicted have been discovered. The Large Hadron Collider at CERN, the most energetic particle collider ever developed (with more than six times the energies of any prior collider), discovered the long-sought-after Higgs boson, but nothing else. Collide electrons and positrons, getting a “clean” signal where 100% of the collider energy goes into producing new particles. Collide protons and either anti-protons or other protons, getting a messy signal but reaching higher energies due to the heavier mass of the proton. Both methods have their limitations, but one unstable particle might give us a third option to make the elusive breakthrough we desperately need: the muon. The known particles in the Standard Model. These are all the fundamental particles that have been directly discovered. Image credit: E. Siegel. The Standard Model is made up of all the fundamental particles and antiparticles we’ve ever discovered. They include six quarks and antiquarks, each in three colors, three charged leptons and three types of neutrino, along with their antiparticle counterparts, and the bosons: the photon, the weak bosons (W+, W-, Z0), the eight gluons (with color/anticolor combinations attached), and the Higgs boson. While countless different combinations of these particles exist in nature, only a precious few are stable. The electron, photon, proton (made of two up and one down quark), and, if they’re bound together in nuclei, the neutron (with two down and one up quark) are stable, along with their antimatter counterparts. That’s why all the normal matter we see in the Universe is made up of protons, neutrons, and electrons; nothing else with any significant interactions is stable. While many unstable particles, both fundamental and composite, can be produced in particle physics, only protons, neutrons (bound in nuclei) and the electron are stable, along with their antimatter counterparts and the photon. Everything else is short-lived. Image credit: Contemporary Physics Education Project (CPEP), U.S. Department of Energy / NSF / LBNL. The way you create these unstable particles is by colliding the stable ones together at high enough energies. Because of a fundamental principle of nature — mass/energy equivalence, given by Einstein’s E = mc2 — you can turn pure energy into mass if you have enough of it. (So long as you obey all the other conservation laws.) This is exactly the way we’ve created almost all the other particles of the Standard Model: by colliding particles into one another at enough energy that the energy you get out (E) is high enough to create the new particles (of mass m) you’re attempting to discover. The particle tracks emanating from a high energy collision at the LHC in 2014 show the creation of many new particles. It’s only because of the high-energy nature of this collision that new masses can be created. We know there are almost certainly more particles beyond the ones we’ve discovered; we expect there to be particle explanations for mysteries like the baryon asymmetry (why there’s more matter than antimatter), the missing mass problem in the Universe (what we suspect will be solved by dark matter), the neutrino mass problem (why they’re so incredibly light), the quantum nature of gravity (i.e., there should be a force-carrying particle for the gravitational interaction, like the graviton), and the strong-CP problem (why certain decays don’t happen), among others. But our colliders haven’t reached the energies necessary to uncover those new particles, if they even exist. What’s even worse: both of the current methods have severe drawbacks that may prohibit us from building colliders that go to significantly higher energies. The Large Hadron Collider is the current record-holder, accelerating protons up to energies of 6.5 TeV apiece before smashing them together. The energy you can reach is directly proportional to two things only: the radius of your accelerator (R) and the strength of the magnetic field used to bend the protons into a circle (B). Collide those two protons together, and they hit with an energy of 13 TeV. But you’ll never make a 13 TeV particle colliding two protons at the LHC; only a fraction of that energy is available to create new particles via E = mc². The reason? A proton is made of multiple, composite particles — quarks, gluons, and even quark/antiquark pairs inside — meaning that only a tiny fraction of that energy goes into making new, massive particles. A candidate Higgs event in the ATLAS detector. Note how even with the clear signatures and transverse tracks, there is a shower of other particles; this is due to the fact that protons are composite particles. Image credit: The ATLAS collaboration / CERN. You might think to use fundamental particles instead, then, like electrons and positrons. If you were to put them in the same ring (with the same R) and subject them to the same magnetic field (the same B), you might think you could reach the same energies, only this time, 100% of the energy could make new particles. And that would be true, if it weren’t for one factor: synchrotron radiation. You see, when you accelerate a charged particle in a magnetic field, it gives off radiation. Because a proton is so massive compared to its electric charge, that radiation is negligible, and you can take protons up to the highest energies we’ve ever reached without worrying about it. But electrons and positrons are only 1/1836th of a proton’s mass, and synchrotron radiation would limit them to only about 0.114 TeV of energy under the same conditions. Relativistic electrons and positrons can be accelerated to very high speeds, but will emit synchrotron radiation (blue) at high enough energies, preventing them from moving faster. Image credit: Chung-Li Dong, Jinghua Guo, Yang-Yuan Chen, and Chang Ching-Lin, ‘Soft-x-ray spectroscopy probes nanomaterial-based devices’. But there’s a third option that’s never been put into practice: use muons and anti-muons. A muon is just like an electron in the sense that it’s a fundamental particle, it’s charged, it’s a lepton, but it’s 206 times heavier than the electron. This is massive enough that synchrotron radiation doesn’t matter for muons or anti-muons, which is great! The only downside? The muon is unstable, with a mean lifetime of only 2.2 microseconds before decaying away. The prototype MICE 201-megahertz RF module, with the copper cavity mounted, is shown during assembly at Fermilab. This apparatus could focus and collimate a muon beam, enabling the muons to be accelerated and survive for much longer than 2.2 microseconds. Image credit: Y. Torun / IIT / Fermilab Today. That might be okay, though, because special relativity can rescue us! When you bring an unstable particle close to the speed of light, the amount of time that it lives increases dramatically, thanks to the relativistic phenomenon of time dilation. If you brought a muon all the way up to 6.5 TeV of energy, it would live for 135,000 microseconds: enough time to circle the Large Hadron Collider 1,500 times before decaying away. And this time, your hopes would be absolutely true: 100% of that energy, 6.5 TeV + 6.5 TeV = 13 TeV, would be available for particle creation. A design plan for a full-scale muon-antimuon collider at Fermilab, the source of the world’s second-most powerful particle accelerator. Image credit: Fermilab. We can always build a bigger ring or invent stronger magnets, and we may well do exactly that. But there’s no cure for synchrotron radiation except to use heavier particles, and there’s no cure for energy spreading out among the components of composite particles other than not to use them at all. Muons are unstable and difficult to keep alive for a long time, but as we get to higher and higher energies, that task gets progressively easier. Muon colliders have long been touted as a mere pipe dream, but recent progress by the MICE collaboration — for Muon Ionization Cooling Experiment — has demonstrated that this may be possible after all. A circular muon/anti-muon collider may be the particle accelerator that takes us beyond the LHC’s reach, and, if we’re lucky, into the realm of the new physics we’re so desperately seeking. The Pierre Auger Observatory has detected more muons from cosmic-ray showers than predicted by the most up-to-date particle-physics models. 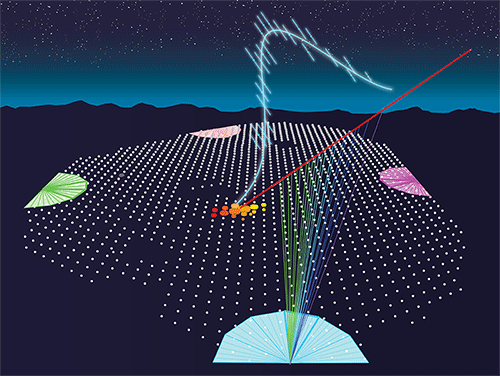 Figure 1:This illustration shows the detection of a hybrid event from a cosmic-ray shower in the Pierre Auger Observatory. The pixels in the camera of the fluorescence telescope (light blue semicircle) trace the shower profile—specifically, the energy loss of the shower as a function of its penetration into the atmosphere. Particles from the same shower are detected on the ground by an array of water tanks (white dots). The red line shows the trajectory of the shower. The Large Hadron Collider at CERN produces proton collisions with center-of-mass energies that are 13 thousand times greater than the proton’s rest mass. At such extreme energies these collisions create many secondary particles, whose distribution in momentum and energy reveals how the particles interact with one another. A key question is whether the interactions determined at the LHC are the same at higher energies. Luckily, nature already provides such high-energy collisions—albeit at a much lower rate—in the form of cosmic rays entering our atmosphere. Using its giant array of particle detectors, the Pierre Auger Observatory in Argentina has found that more muons arrive on the ground from cosmic-ray showers than expected from models using LHC data as input . The showers that the Auger collaboration analyzed come from atmospheric cosmic-ray collisions that are 10 times higher in energy than the collisions produced at the LHC. This result may therefore suggest that our understanding of hadronic interactions (that is, interactions between protons, neutrons, and mesons) from accelerator measurements is incomplete. Cosmic rays are relativistic particles (mostly protons and light nuclei) that are produced by supernovae and other powerful sources in and beyond our galaxy. When a cosmic-ray particle collides with a molecule in Earth’s atmosphere, it generates a cascade of secondary particles. An incident proton, for example, will typically expend 40% of its energy producing a secondary proton or neutron, together with a large number of other hadrons, mostly pions. Neutral pions decay immediately to two photons that generate an electromagnetic “cascade” comprising electron-positron pairs and gamma rays. Charged pions with high energies interact again in the atmosphere. The neutral pions they produce contribute further to the electromagnetic component of the shower, while other particles carry energy forward to subsequent interactions. Lower-energy charged pions decay before interacting again and produce muons, which largely survive to the ground. Unlike detectors at accelerators, experiments like Auger do not directly detect the initial collision but only the secondary cascade that it generates. This is simply because the rate of events is too low: At an energy equivalent to 10 times the center-of-mass energy at the LHC, the cosmic-ray flux is only about one particle per square kilometer per year. This is far too low to observe the collision directly with a detector in space or a balloon-borne detector above the atmosphere. Auger, with a detector array that spans 3000 square kilometers, may collect only a few thousand such events per year. In comparison, the LHC can produce a billion proton collisions per second. Auger observes the first interaction indirectly by analyzing the shower of particles it generates . To detect shower particles that reach the ground, the observatory uses 1660 water-filled tanks separated from each other by more than a kilometer. When struck by a high-speed particle, the water emits a flash of light (Cherenkov radiation). Auger complements the detection of particles on the ground by tracking the path of a cascade in the atmosphere with four telescopes, placed at the perimeter of the array, that are sensitive to the fluorescent light generated by the cascade (Fig. 1). Events seen by both the fluorescence telescopes and the water tanks are called hybrid events. They constitute only a small fraction of all of the ground events because the fluorescence can only be observed on clear, moonless nights. However, they are a particularly valuable subsample because the fluorescence from the shower as a function of its penetration into the atmosphere—the shower profile—is sensitive to the mixture of nuclei in the primary cosmic radiation . Also, because most of the muons arriving at the ground are from interactions involving charged pions, the ground signal is primarily sensitive to the properties of hadronic interactions. On the other hand, the atmospheric cascade probed by the telescope consists mostly of electrons and positrons descended from the first few hadronic interactions. It therefore reflects the primary particles’ energies. In their new analysis, the Auger collaboration uses a sample of 411 hybrid events, collected over nine years, in a narrow energy range of around 1019 eV. For each hybrid event, the Auger researchers compare two quantities: the signal measured at the ground and the signal expected at the ground, which they compute with models that use parameters determined by the latest LHC measurements. A complication for these computations is that they depend on the identity of the nucleus involved in the first collision and on where in the atmosphere the shower starts and how it develops, all of which vary from shower to shower. To solve this problem, the Auger team simulates each event 25,000 times, on average, thereby sampling all the possibilities for how the different particle interactions are distributed in energy and in the atmosphere. They then pick several simulations that fit the telescope measurements well. From these “best fit” telescope measurements, they predict the signal on the ground using two models based on LHC data. But there is an additional wrinkle. The signal at the ground comes both from muons and from the electrons and positrons produced by the electromagnetic cascade. Since these two components cannot be distinguished, the researchers must predict them separately. Fortunately, the electromagnetic component dominates for cascades arriving from straight above the observatory, while the muon component dominates for angles of arrival exceeding 37 degrees. (The data correspond to events with arrival angles from 0 to 60 degrees.) Taking account of this difference, the researchers scale the two components predicted by the models separately to obtain the best fit to the data. The scaling factor they get for the electromagnetic component is near unity, but it is between 1.3 and 1.6 for the hadronic component. In other words, Auger has detected about 30–60% more muons than expected. This discrepancy has been seen before. In 2000, the HiRes-MIA hybrid array in Utah found a higher density of muons at 600 m from the shower’s trajectory than expected from (then current) models of hadronic interactions . Last year, the problem showed up in the analysis of nearly horizontal showers at Auger . The new results from Auger put the muon excess on a firmer basis by making a tight connection between the telescope measurements and the signal on the ground. This finding suggests that the best models of hadronic interactions are missing something. One possibility is that they do not account for a process that keeps more energy in the hadronic component; for example, a higher production of baryon-antibaryon pairs . Another option is that the physics of strong interactions changes at energies beyond those tested at the LHC [7, 8]. What’s next? The Auger collaboration can extend its analysis outside the narrow energy range to look for an energy dependence of the discrepancy, which would provide a clue to its origin. For a complementary test, they could also analyze other observables that are sensitive to hadronic interactions, such as the height at which muons are produced. Finally, a significant upgrade called “Auger Prime” is underway . This will allow the team to measure the muon and electromagnetic contributions to the ground signal separately, removing a significant source of uncertainty in their current analysis. 1. A. Aab et al. (Pierre Auger Collaboration), “Testing Hadronic Interactions at Ultrahigh Energies with Air Showers Measured by the Pierre Auger Observatory,” Phys. Rev. Lett. 117, 192001 (2016). 2. A. Aab et al. (Pierre Auger Collaboration), “The Pierre Auger Cosmic Ray Observatory,” Nucl. Instrum. Methods Phys. Res., Sect. A 798, 172 (2015). 3.A. Aab et al. (Pierre Auger Collaboration), “Depth of Maximum of Air-Shower Profiles at the Pierre Auger Observatory. II. Composition Implications,” Phys. Rev. D 90, 122006 (2014). 4.T. Abu-Zayyad et al. (HiRes-MIA Collaboration), “Evidence for Changing of Cosmic Ray Composition between 1017 and 1018 eV from Multicomponent Measurements,” Phys. Rev. Lett. 84, 4276 (2000). 5 A. Aab et al. (Pierre Auger Collaboration), “Muons in Air Showers at the Pierre Auger Observatory: Mean Number in Highly Inclined Events,” Phys. Rev. D 91, 032003 (2015). 6 T. Pierog, “LHC Data and Extensive Air Showers,” EPJ Web Conf. 52, 03001 (2013). 7 G. R. Farrar and J. D. Allen, “A New Physical Phenomenon in Ultra-High Energy Collisions,” EPJ Web Conf. 53, 07007 (2013). 8 J. Alvarez-Muñiz, L. Cazon, R. Conceição, J. Dias de Deus, C. Pajares, and M. Pimenta, “Muon Production and String Percolation Effects in Cosmic Rays at the Highest Energies,” arXiv:1209.6474. 9 A. Aab et al. (Pierre Auger Collaboration), “The Pierre Auger Observatory Upgrade – Preliminary Design Report,” arXiv:1604.03637. Cosmic rays are energetic particles, mostly atomic nuclei, raining down upon the Earth from the depths of the cosmos. Understanding their detailed nature and origins remains a primary goal in modern-day astroparticle physics. When cosmic rays enter the Earth’s atmosphere they produce a shower of billions of particles. These particles travel nearly at the speed of light and a large part of them will reach the ground and can be detected by the water-Cherenkov stations of the Pierre Auger Observatory. The most energetic cosmic rays are able to produce particle showers which have a footprint at the ground of a few km2. Among the produced particles there are muons, elementary particles similar to electrons but with a much greater mass. The paper shows a novel technique to estimate where in the atmosphere the muons that we measure at Earth are produced. As the muon signal is a measure for the nature of the primary cosmic ray, this technique may help solve one of the most persisting questions surrounding ultra-high energy cosmic rays: What are they? Identifying the muons using the surface detector of the Pierre Auger Observatory is not an easy task. However, each type of particle (muon, electron, photon) produces a signal with a characteristic amplitude and time structure. Muonic signals are spiky and have a narrow time distribution (tens to hundreds of nanoseconds) while signals produced by electrons and photons are small, smoother-looking and characterised by a wide time distribution (microseconds). This is especially true for stations far from the impact point of the shower at the ground. By applying a “low-pass” filter to the signal repeatedly, it is possible to gradually separate the low-frequency smooth electromagnetic signal from the high-frequency component which is primarily due to muons. The technique is effective over a large range of arrival directions (i.e. for zenith angles between 45° and 65°), and for energies greater than 1.5 x 1019 eV. Once the muon signal is estimated station by station, together with its time structure, the atmospheric depth at which muons had been produced is obtained by applying a model of their arrival time at the ground. The geometry used to reconstruct the muon production point is depicted in the figure on the left. The model is based on the fact that muons are produced close to the shower axis and that they travel to the ground following straight lines. For each muon sampled at the ground, its atmospheric production depth is estimated: the set of these forms the Muon Production Depth (MPD) distribution, as shown in the figure on the right. Left: Schematic view of the geometry used to obtained the muon production point. Muons are produced at the position z along the shower axis and, after traveling a distance l, they reach the ground and may hit a station of the surface detector. Right: The reconstructed MPD distribution for a imulated shower induced by a proton with θ=48° and E = 6.3 x 1019 eV. The maximum of the distribution, which is called Xμmax , is the point at which the maximum number of muons is produced, which is a function of the mass of the cosmic ray. Heavy primaries induce showers which reach maximum production higher in the atmosphere compared to light primaries.This method can thus be exploited to study the mass composition of the most energetic cosmic rays detected by the Pierre Auger Observatory. In addition, Xμmax depends sensitively on the properties of the hadronic particle interactions taking place in the atmosphere. Its measure is a nearly optimal tool to test hadronic interaction models at energies well above those attainable with accelerators such as the Large Hadron Collider (LHC) at CERN. This novel technique is described in detail in the paper below. Auger results on the mass composition of the highest energy cosmic rays will follow in future publications. The Pierre Auger Observatory is an international cosmic ray observatory in Argentina designed to detect ultra-high-energy cosmic rays: sub-atomic particles traveling nearly at the speed of light and each with energies beyond 1018 eV. In Earth’s atmosphere such particles interact with air nuclei and produce various other particles. These effect particles (called an “air shower”) can be detected and measured. But since these high energy particles have an estimated arrival rate of just 1 per km2 per century, the Auger Observatory has created a detection area of 3,000 km2 (1,200 sq mi) — the size of Rhode Island, or Luxembourg — in order to record a large number of these events. It is located in the western Mendoza Province, Argentina, near the Andes. Construction began in 2000, the observatory has been taking production-grade data since 2005 and was officially completed in 2008. The observatory was named after the French physicist Pierre Victor Auger. The project was proposed by Jim Cronin and Alan Watson in 1992. Today, more than 500 physicists from nearly 100 institutions around the world are collaborating to maintain and upgrade the site in Argentina and collect and analyse the measured data. The 15 participating countries shared the $50 million construction budget, each providing a small portion of the total cost.